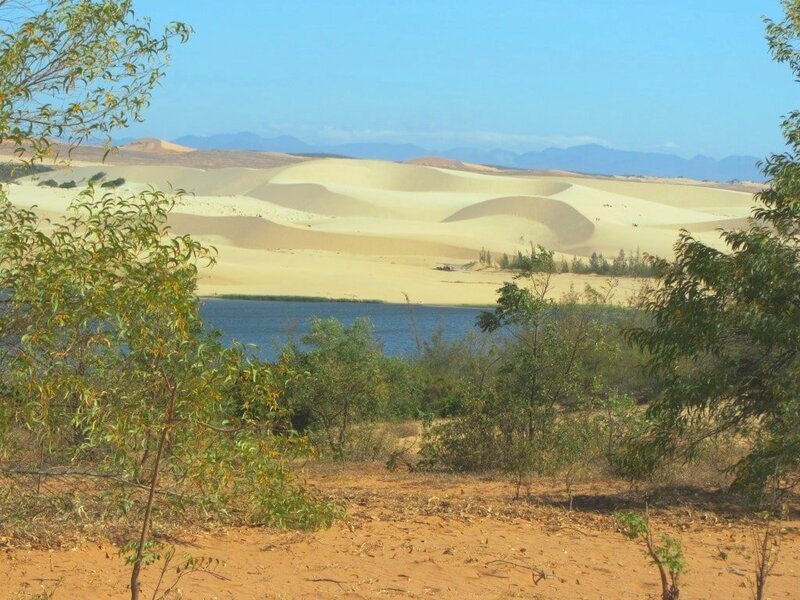 Get off the beaten track from Mui Ne for a couple of days, by renting a motorbike and heading northeast up the coast on this short, scenic, easily navigable, and rewarding road trip. A new, deserted highway leads beyond the famous white sand dunes of Mui Ne, through desolate swathes of arid landscape, towards Lien Huong, where there’s a long stretch of good beach. Continue to Ca Na and spend the night on the beach before heading back to Mui Ne the next day. 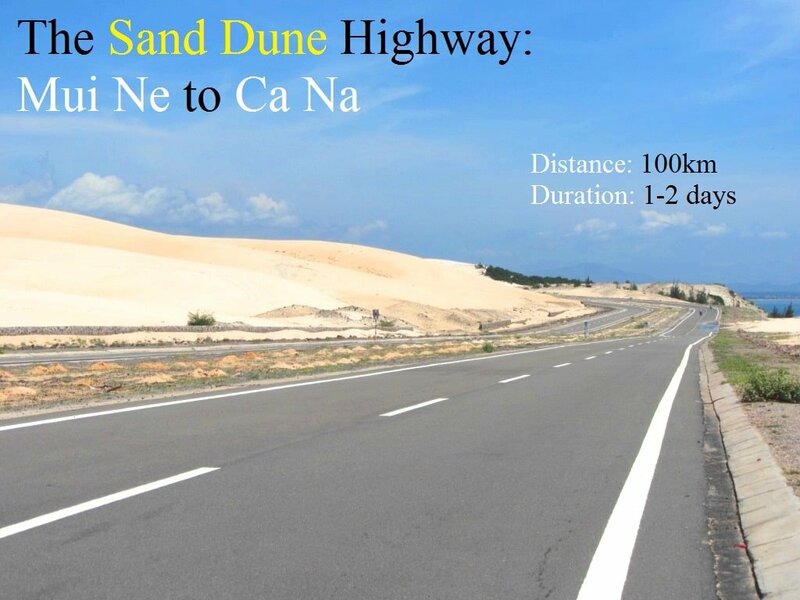 On this page, I’ve written a description of the road trip from Mui Ne and Ca Na, including directions, a route map, and suggestions of places to stay, eat, and see along the way. Although the total distance is only 200km (including the return journey), it’s best to take two full days to complete this route: one day there and one day back. Anytime of year is good for this route. Renting a motorbike from Mui Ne shouldn’t be a problem, but don’t leave your passport with the rental company as you will need this to stay in any accommodation on the road. Be aware that traffic police are often on the prowl for foreigners on the coast road between the Red Dunes and the White Dunes (see map). If you’re stopped, be polite and patient, and have 200,000vnd of loose change in your pocket, ready to pay the fine (assuming you don’t have a Vietnamese driving license). Or, if you want to avoid the traffic police altogether, you can take an alternative road (marked in red on my map), but this is a shame because it bypasses the coast road. 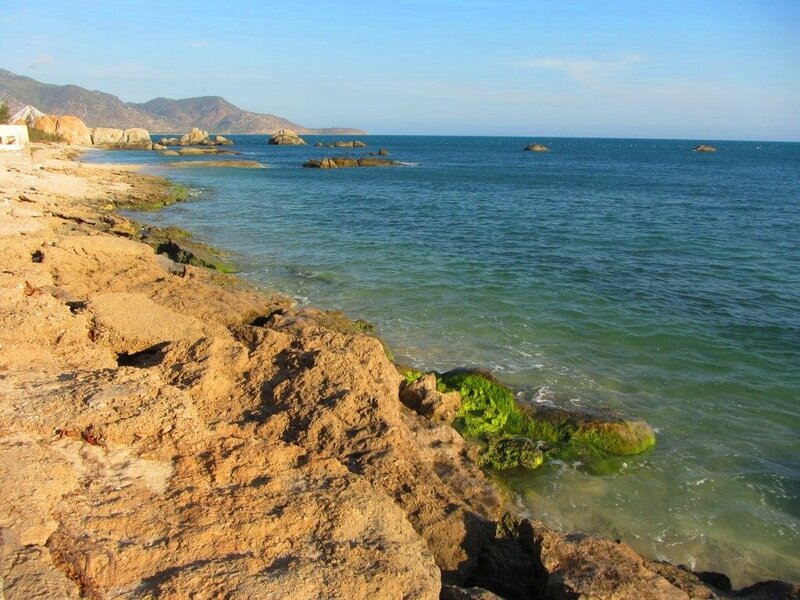 At the end of this road trip, you can continue north from Ca Na on the fabulous coast roads to Nha Trang (for more information, take a look at my guides in the Related Posts at the bottom of this page). 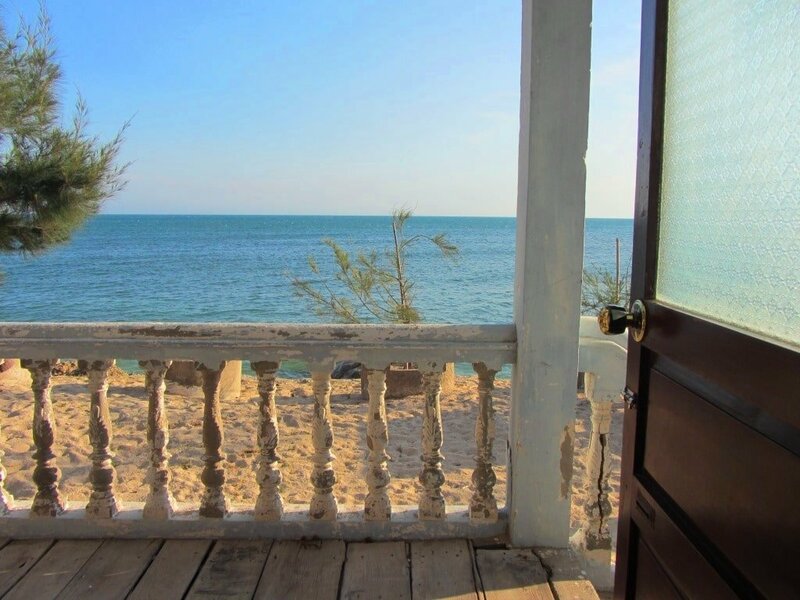 Head east along the coast on Nguyen Dinh Chieu Street, past all the resorts on Mui Ne beach, and turn left onto Huynh Tan Phat Street just before reaching Mui Ne fishing village, near the tip of the peninsular. 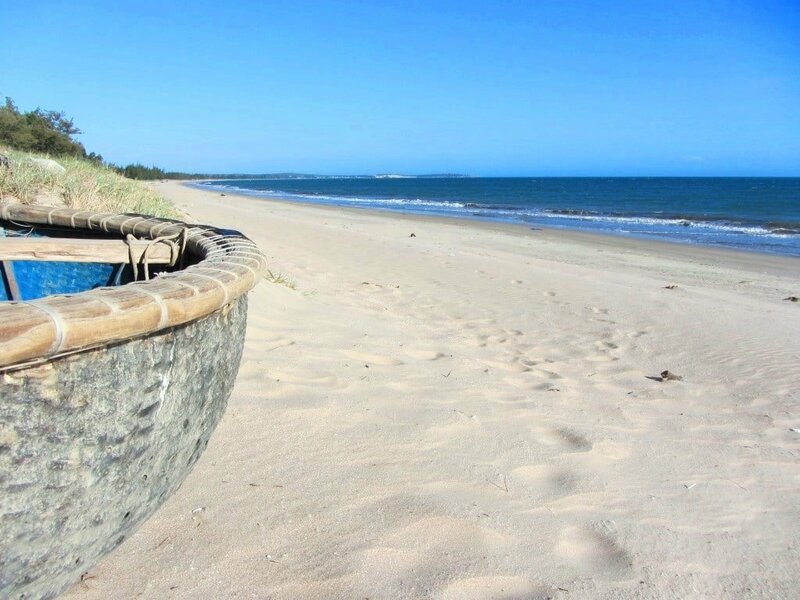 Before this turn-off there’s a lovely (and much-photographed) view over a crescent bay, where the entire Mui Ne fishing fleet is anchored in shallow, calm waters; their blue-painted wooden bows nodding gently in the surf. From here, follow Road DT716 past the Red Sand Dunes, along the coast, and all the way to the White Sand Dunes. This road is still relatively new and in good condition. As the resorts fade away, so too do most of the tourists and traffic. This is a glorious stretch of coast road: salt and sand in the air, waves breaking on one side, sand dunes on the other – it’s what motorbike road trips on the south coast are all about. However, the traffic police are out to spoil it. Ride slowly and carefully; stay in the bike lane at the side of the road; and make sure you’re wearing your helmet. The cops are usually positioned between Hon Rom Resort and Long Son Campgrounds (see my marker on the map). If you get stopped (and it’s highly likely you will), there’s not much you can do other than smiling, being polite and patient. It’s a good idea to carry the phone number of the place you rented your bike from and giving them a call if/when you get stopped: perhaps they’ll be able to help. If not, at some point you’ll probably be shown a list of fines to pay. After fumbling around in your pockets, take out some notes that add-up to roughly 200,000vnd ($10) and that should cover it. Then, hopefully, you can get back on your bike and hit the road. (If you want to avoid the police altogether, try taking the longer, alternative route instead, marked in red on my map). After encountering the traffic cops, it’s a beautiful ride along more deserted coastline, onto an arid, sandy plateau covered in cassava plantations, and then a sharp left turn (due north) up a steep hillside, before reaching the turn-off (due east) for the White Sand Dune Highway. Just a couple of years ago, this road was nothing more than a red-dirt track (as seen in the video above). But now, it’s a brand new, gleaming, four-lane ribbon of black asphalt, stretching into the distance. You’ll see the impressive White Sand Dunes on your left, rising behind a cobalt-blue lake. You can walk and slide on the dunes as much as you like, which is great fun. (Note: the sand gets very hot during the middle of the day; but the dunes get quite crowded in the late afternoon). Sadly, you are now also allowed to drive on the dunes on quad-bikes. Personally, I’d advise against this, because the tyre tracks are starting to ruin the aesthetic appeal of the once smooth contours and undisturbed sand that the dunes are (were) famous for: I can’t believe they were allowed here in the first place. 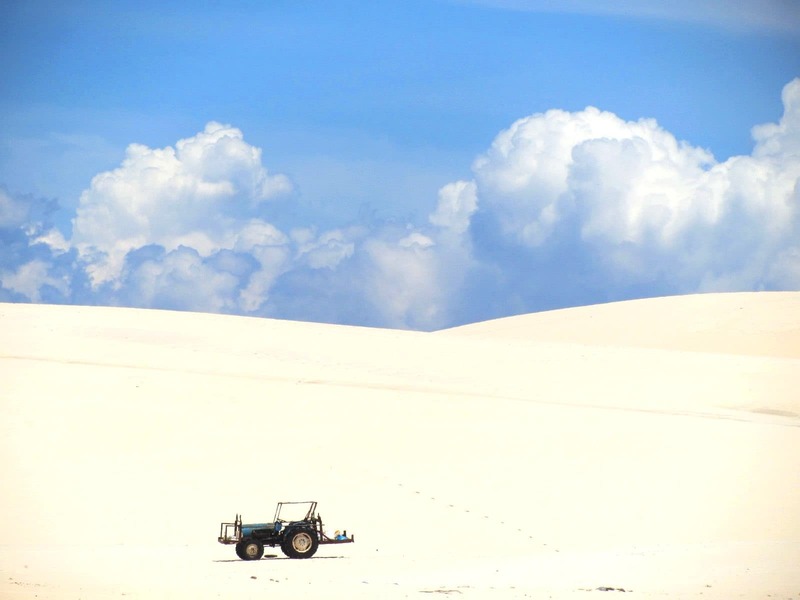 Stay on the White Sand Dune Highway as it leaves the dunes behind and drops off the tourist radar altogether. From here to Phan Ri Cua fishing village it’s 20km of smooth tarmac through uncultivated, dry, desert-like terrain. In the soaring temperatures during the middle of the day, there’s something thrilling about this burnt, thirsty landscape, with the ocean and the curving coastline always visible to the east. The new highway ends when it hits a bridge over a river and enters Phan Ri Cua. If you need somewhere to stay for a night, there are several cheap, OK guesthouses here: Nhà Nghỉ Thêu Thanh (0917 387 533) and Nhà Nghỉ Bốn Côi (0916 222 066) are both around 200,000vnd a night. 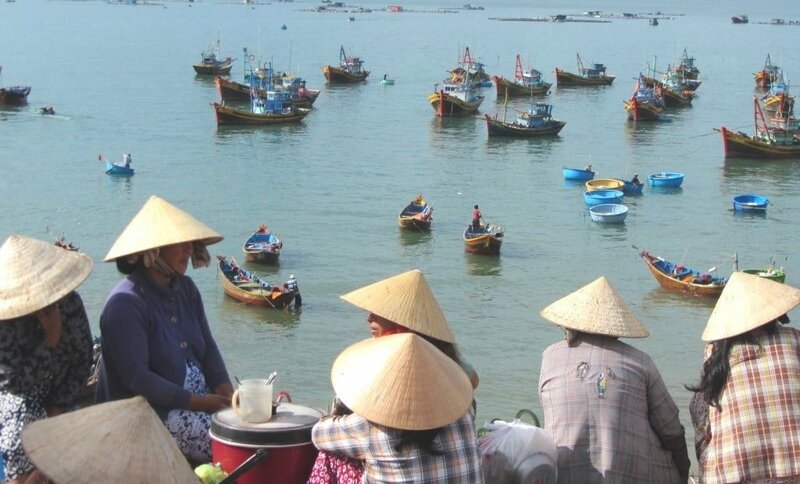 Like most out-of-the-way fishing villages in Vietnam, there’s a rough edge to Phan Ri Cua. However, it’s an exceptionally lively place for its size. There’s usually a good cluster of street food vendors around the busy and fascinating central market, where you can find snacks, drinks and meals for a couple of dollars. I always enjoy a brief lunch stop here, soaking up the frontier-like atmosphere of this town. Take Ha Ba Trung Street south through Phan Ri Cua and turn left (due east) onto Quang Trung Street. For a few kilometres this road follows close to the shore until it meets a rocky bluff that is completely covered with ramshackle fishermen’s dwellings: it looks like a barnacled rock. The road works its way around to the other side where a curving bay stretches out before you. For 10 kilometres Road DT716 runs along this excellent beach, with not a hotel or tour group in sight. Stop for a swim in the glistening sea, and some food and drink at the shacks at the far end of the beach. When the road reaches the end of the bay, turn left (due north) on Vo Thi Sau Street. This is a dual carriageway which, after a few kilometres, leads into Lien Huong. It’s a hot and dusty town, but there are several places to eat and drink on Le Duan Street, and also a few decent guesthouses if you need a place to stay. Nhà Nghỉ Phong Ngân (0903 044 345), Hotel Đào Nguyên (0623 951 800), and Hotel Hương Nam (0623 851 286) are in a row on Vo Thi Sau Street as you enter town; they all offer clean rooms for around 200,000vnd. 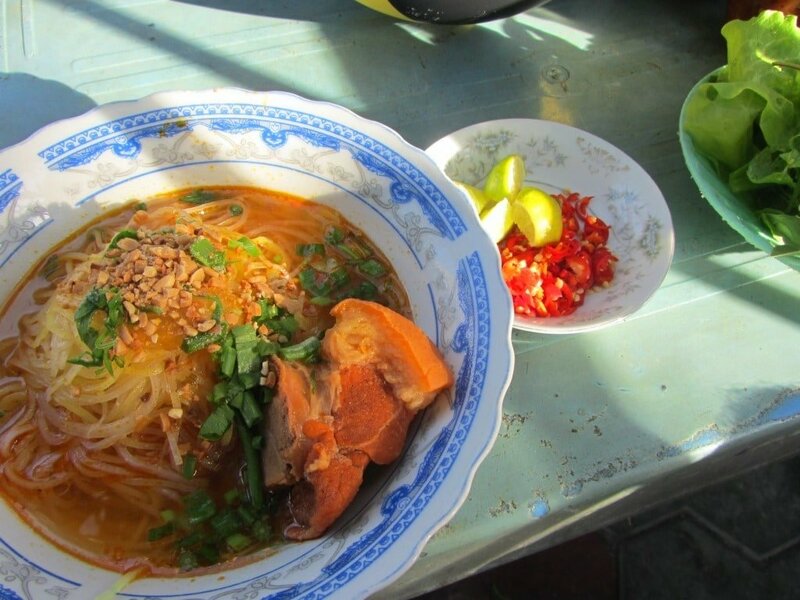 From Lien Huong, head north on Le Duan Street, then turn left when it joins 15 Tháng 4 Street. After a couple of minutes you’ll hit Highway 1. Take the highway (which, thanks to recent upgrades, is now in excellent condition) due north, as it ploughs through an arid landscape of rocky hills and giant salt fields. After 10km the highway bears east, passing the enormous site of Vinh Tan coal power plant. The last few kilometres to Ca Na is a beautiful ride: the deep blue East Sea on one side and a parched landscape dotted with cacti and arid mountains on the other. The highway meets the sea at Ca Na, where there are several gas stations, roadside restaurants and places to stay on the beach. It’s a good spot, but the highway and the train line run close the beach, making noise pollution an issue. I usually choose to stay at the Ca Na Hotel (068 3760 922), which has seafront bungalows from around 300-400,000vnd. Although the accommodation is nothing special, the beach is very pretty and it’s a good place to relax for a night before heading back to Mui Ne. (Note: watch your head on the bathroom doors at this hotel; they’re quite low). 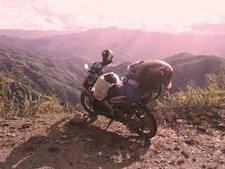 Alternatively, if this ride has whetted your appetite for deserted ocean roads, extend your road trip by continuing north along the coast from Ca Na to Phan Rang, and from Phan Rang to Cam Ranh and Nha Trang. 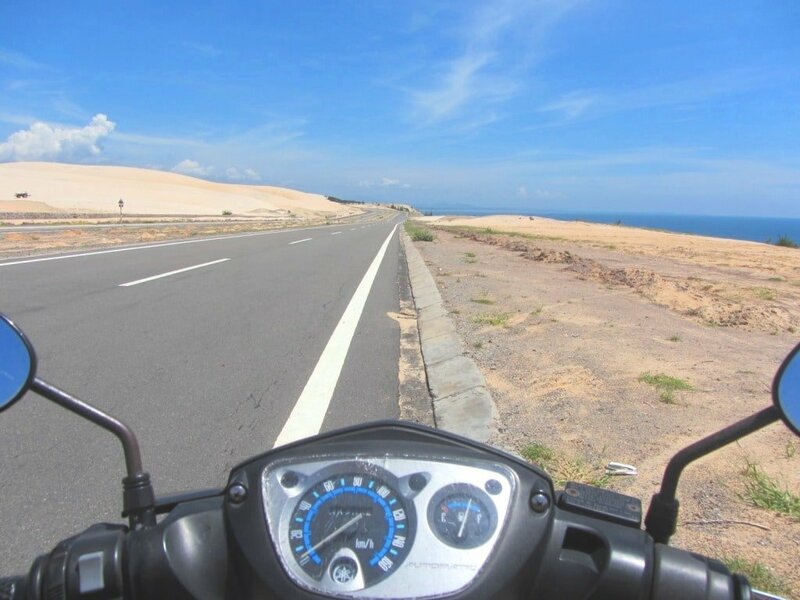 This entry was posted in ALL, Coastal, MOTORBIKE GUIDES, Mui Ne, The South and tagged beach, Ca Na, guide, Lien Huong, motorbike, Mui Ne, Phan Ri Cua, road trip, travel, Vietnam, white sand dunes. Bookmark the permalink. Having just done the detour recommended by Tom (except i took it all the way to QL1H rather than cutting back down towards Mui Ne), I wanted to add that it’s a lovely road, crossing green pastures and wide open spaces, with hardly anyone on the road, and no wind! (Can’t say as much for the coastal roads!!). Also, on road 716B (along the coast between Mui Ne and the white sand dunes, practically across from Bau Trang lake there is a coffee shop “cafe dream bay”, it’s funky with plenty of outdoor (but protected) seating, wide choice of drinks and nice people. Glad to hear the detour route worked out for you. And thanks for the cafe recommendation – sounds great! Hi Tom, thanks as always for great guides. 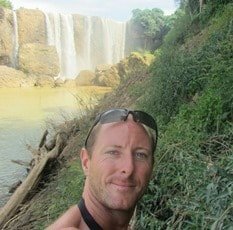 I’m riding on my way from Nha Trang to Phan Tiet train station tomorrow, stopping for a few nights along the way, and wanted to know if there was any update regarding the police (hours in particular). I don’t mind doing a small detour on my last day riding to the train station. I was already stopped once on my way from Saigon to Juliet’s Villa on back roads, and ended up paying $20 after 25min negotiations (I was following rule and I have all the papers including international driving permit, this was an obvious racket sadly), so would like to avoid a second stop! Riding on QL27C from Da Lat to Nha Trang I came across a great stop, will see if I can find yor post on that road so I can update there (as well as road condition and windy pass). Sorry to hear about the police. 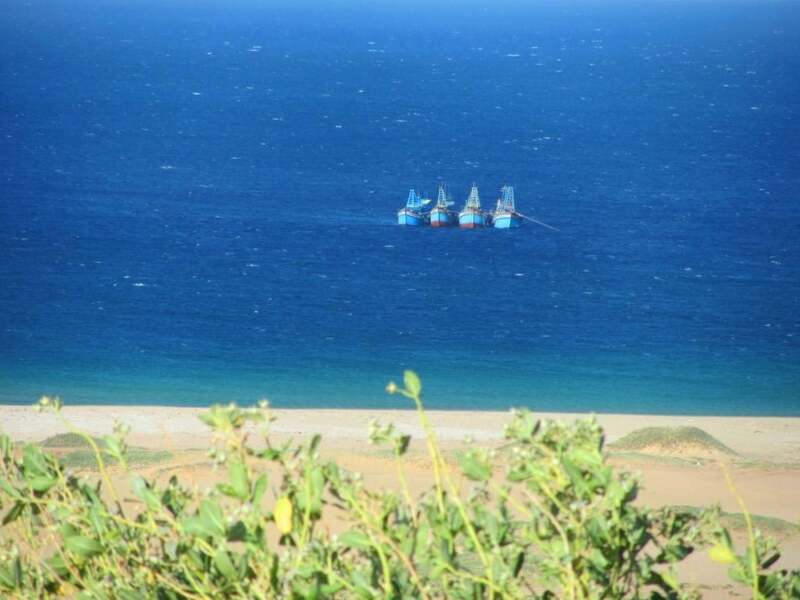 The situation in Mui Ne is the same as always. But if you take the route I’ve marked in red on the map on this page you should be able to avoid them – I’ve never been stopped taking the red route. But of course you never know for sure. The other alternative is just taking Highway QL1A, but there are sometimes police on that too. They international license doesn’t really work – you need a local license, then you should be fine, even if you get stopped. The stop on QL27C sounds great. Ps: not sure where to post this but the stop on QL27C was Suối Đá Hòn Giao. It’s about 1h10 before arriving into Nha Trang. It’s a restaurant along the river, the first section close to the road is mostly used by large groups but walk further towards the back and there is a lovely area along the river, with giant animal reproductions scattered across a park. The views are great, the water is perfect for cooking, and I enjoyed my food. Thanks. I’ve seen that place before but never stopped there. I’ll try it out next time I ride QL27C. Stealing dogs does happen occasionally in Vietnam. It’s usually in more northern areas, where dog restaurants are more common than in the south. On the other hand, dog ownership in Vietnam (as pets) has massively increased in recent years, so many people love them. I think you’ll be fine with your dog in Lien Huong, but you’ll have to decide for yourself whether you feel comfortable taking the dog or not. I ve been using your guide to plan my trip and is really usefull… so here is my way to contribute. Regarding POLICE in Mue ne, I crossed there a few days ago (as of Feb 17) and here is the trick. They do move between those two resorts you mentioned BUT they are only there from 7 AM to 5 PM, actually I saw them leaving at 4:55 PM and the next day I crossed at 6:30 AM heading north and there was nothing… so if you want to save 200k dong, I suggest to wake up early. Thanks for the guide man, I´m half way through. That’s great info, thanks a lot for sharing it. So the police are there pretty much all day, but a nice, early start means you can avoid them – perfect! A word of caution though: there is zero decent “quán ăn” in Cà Ná, only a bunch of tourist seafood rwstaurants for groups. I agree! 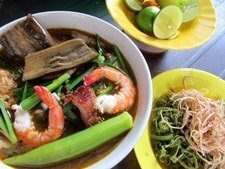 I’ve rarely found good food in Cà Ná – the seafood restaurants are generally overpriced. I had decent food at Hon Co Resort once, and there was a lẩu (hotpot) place on the non-beach side on the road a couple years ago. I hope it improves soon. Great ride on a very strange road. And the hotel Ca Na is decent as promised. A bit too many tourists on jeep tours, but thats about the only hassle. The views are breathtaking. Thanks as always for your great advice! Good to hear you liked the hotel. And, yes, I agree about the bus-loads of tourists stopping by for lunch. Great site this. Very well done. 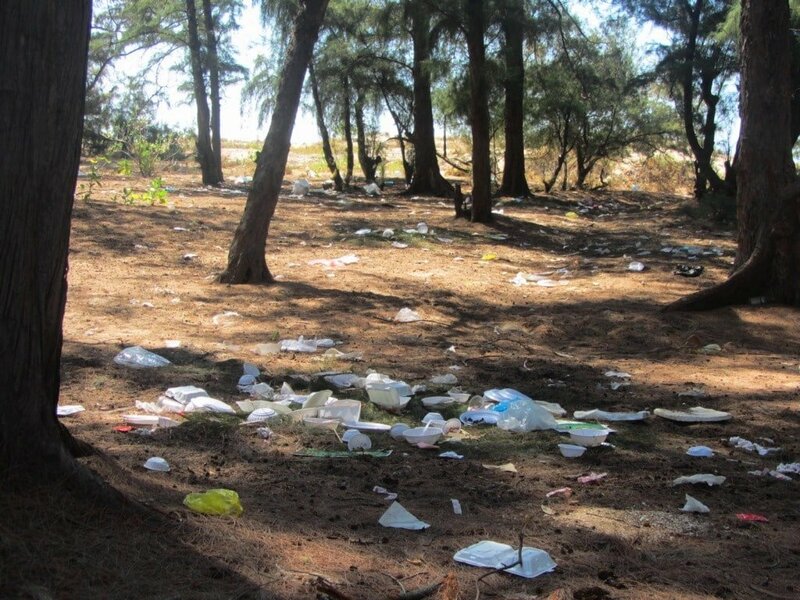 I like your comments regarding rubbish along the coast and he lack of education with the locals. 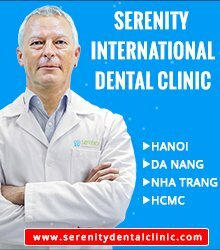 I come to HCMC regularly from OZ for my business and after work always come to Ham Tien for a bit of laidback attitude. 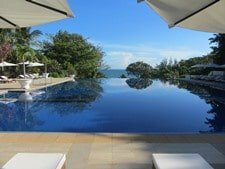 I mention Ham Tien as it is wrongly known as Mui Ne and has been causing problems for the Tourism Industry as people often book a Resort in Mui Ne and get dropped in Ham Tien which they think is Mui Ne . The 2 places are very different as you know with most of the activity in Ham Tien Mui Ne being more of a destination resort town. It is very surprising to travel these roads alone often being the only person using this bit of infrastructure. You are right in suggesting that the area will attract development, but I feel nothing is going to happen until the Mui Ne Airport is constructed , and that is if ever. Thanks for a good well produced effort. Thanks. Yes, they are often confused, but if resorts on the Mui Ne-Ham Tien strip keep spreading it may not be long until the two become one! However, the beach is slowly disappearing for many resorts and further up the coast, so perhaps this will have an effect on future development too. I hope you enjoy your next trip to Vietnam. What I meant to say was: our trip will be 2 weeks long. We are traveling in October 2015. I’m sorry about the miscommunication. Well, 2 weeks is not very long for a Saigon to Hanoi motorbike trip. But October is a decent time of year to do it. 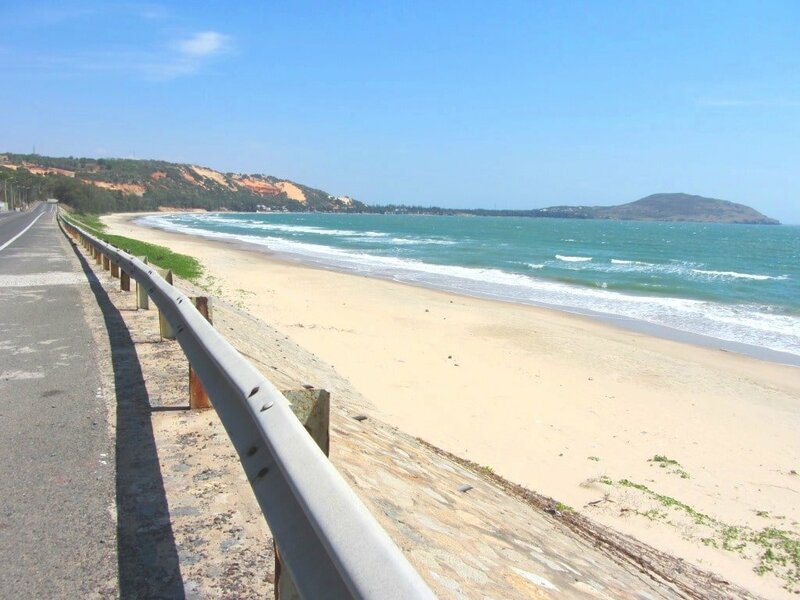 I think the Lien Huong beach on this page is nice, but if you’ve only got 2 weeks you should make your coastal ride either or both of these: the Nui Chua Coast Road and the Mui Dinh Promontory road. These are fabulous stretches of coastal scenery on excellent roads, and if you don’t ride it on a weekend, you’ll have it to yourself. You could easily stay at the Vinh Hy guest house on the Nui Chua Road. Check the links to the relevant guides in the previous sentence. Also, if you’re planning your road trip, take a look a this route map that I have just published for some more ideas. 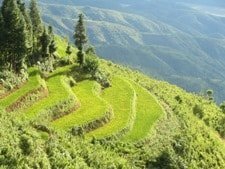 My husband and I are planning a motorbike trip from Saigon to Hanoi in 2 weeks. Our plan is to rent the bikes and have them delivered to our hotel. We will then drop them off at the end of our trek. I was just reading about this beautiful beach and it was making me want to visit. We would love to see things like this, but we also want to experience Hoi An and Hue. Would a stop at this beach be reasonable during our drive? We would really like to stay off of highway 1 like you advised. We are up for any tips that you may have. If you had 2 weeks to make the trip, what would be your MUST SEE things. We are adventurous and really like unique cultural things.